“What if you had said yes . . . ? 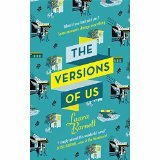 The Versions of Us was a Red Magazine recommended read for the summer – and so I borrowed it from our local library (get me!) It was actually quite a novelty to read a proper book, as, despite waiting a long time to be convinced that a Kindle was a good idea, I now rarely read in any other format. The book follows the stories of Eva and Jim and how their futures pan out dependent on the decisions made at their initial meeting (think Sliding Doors – 1990s film reference there #ontrend). It is beautifully written and follows their lives through from 1958 to the present day – with many major life events happening throughout the book. It is very clever in that many of the same events happen in all 3 possible versions (reminding me quite a lot of the recent critically acclaimed TV drama ‘The Affair’). Occasionally I did get a bit confused – particularly with Eva and Jim’s children and grandchildren – as in each scenario this is one major difference, and I would sometimes forget which was which – but this is my only slight criticism. It crosses decades and countries effortlessly, and the writing (and editing – I am such a book geek!) is excellent. It must have been so complicated to ensure that everything stacked up properly in each scenario and in the scenes that featured in more than one version. It is interesting that in all 3 versions I liked Eva, but my feelings for Jim changed significantly. Also, I liked the fact that none of the versions were perfect – it wasn’t a typical love story where boy meets girl and lives happily ever after in any of the scenarios. I would definitely recommend this book – and look forward to reading more novels by Laura Barnett in the future. ← A lesson in spray tanning!